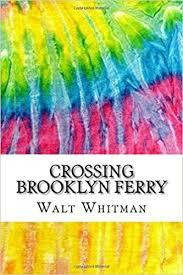 In his poem, Crossing Brooklyn Ferry, Walt Whitman gives the reader his observations of nature and of the human experience, using a simple ferryboat crossing as his device. Paper Masters custom writes research papers on poems and poets such as Walt Whitman and his poem Crossing Brooklyn Ferry. Poetry is difficult to understand for college level literature courses. Have us help you today by explaining Whitman's poem in a custom research paper, written exactly according to professor's guidelines. Though he is just one person (“I was one of a crowd”), Whitman nonetheless is awestruck as a single soul by the rushing water, the huge ships in the river, and the awesome sight of the vastness of New York’s buildings and bustling activity. People in the city go about their business, adding vitality to the city, which Whitman proclaims he loves. Further, the poet reflects on his happy experiences of walking through Brooklyn and Manhattan, loving and appreciating what the city offers. The river becomes a metaphor of life itself: “I too had been struck from the float forever held in solution, I too had receive’d identity by my body…”. Yet, Whitman also speaks of the dark side of city life, as in Section 6: “refusals, hates, postponements, meanness, laziness, none of these wanting”. These, however, are overcome by the majesty of the river, which ebbs and flows, just as life itself ebbs and flows. While he might be anonymous – as are all others on the ferryboat, Whitman still feels a kinship with all the others, for like them, the poet knows the river touches them all. “Great or small, you furnish your parts toward the soul”. No matter how great or small our accomplishments, we all share an unbreakable bond with the river, which sustains and nourishes us in its own unique way. Walt Whitman and Slavery research papers illustrate how Whitman changed his views on slavery. Order a custom research paper on Whitman at Paper Masters. Out of the Cradle Endlessly Rocking research papers on Walt Whitman poetry. Leaves of Grass Research Papers examine Walt Whitman's famous poem and can be custom written to your exact specifications. Paper Masters writes custom research papers on Crossing Brooklyn Ferry by Walt Whitman.